Sometimes you plan out your big trips: research the charts, search out local knowledge, follow the weather patterns, open the schedule to go when conditions permit, train your body and mind to be ready to handle the worst. And sometimes you pick a date, jump up off the couch and just go. And get lucky. Four of us CCK instructors (Sean, Matt, Anders and myself) picked a date to paddle the Lost Coast and came up with a general plan. Sean instigated the trip and came up with the starting and finishing points (and the necessary back-country permit); Anders did the chart work and sent out emails to get any advice we could. I myself just looked over the route on Google Earth but didn't do much to physically prepare - I paid for that with some tendonitis issues but nothing terrible. The plan was to put in outside Ferndale, paddle 75 miles down a remote and exposed coastline, and get out back at Highway 1 just north of Ft. Bragg. We all took plastic boats ready to play in the rocks as time allowed. We knew we had some protected landing options but an exposed launch to start and possibly again at the end. We all had a four day window between wives and work to squeeze it in without running into major problems in our real lives. It seemed do-able but certainly not a given. But it all turned out well. Small swells on the first day allowed an easy start. The winds were generally light or at our back. We found some rocks to play in and generally we had long days of paddling (8 hours/day) with sunny skies. We had some nice campsites, generally shared with hikers or surfers, some lonely lunch spots with stunning scenery, and lots of good times with good friends. The last day had some of the best caves and tunnels to play in, which kept us busy in the morning. The afternoon found strong headwinds and growing swells which led to a couple guys getting out a little earlier while the other two of us continued on to paddle down to the truck and then retrieve the others on our way back north to get my vehicle from the put in. The swells had grown but our takeout site, a random alternate from where we had originally planned, turned out to have more protection than expected and the landings went smooth. All in all it was a great trip with very minor issues (a flooded hatch, a lost spare paddle, missing sunglasses). It is a beautiful stretch of coast that transitions from big off shore rocks (like Trinidad) to a maze of tunnels and slots (like Mendocino). Sean's much more complete writeup is HERE. Anders is working on putting together the video that we all shot so hopefully that will have some good stuff - but it may take a while. A quick edit of my video is below. And here's a link to the rest of my pictures from the trip. You have received this message because spotbryant has added you to their SPOT contact list. It's kind of interesting how folks get ready for a trip. Is it a big trip or little trip? New area or familiar ground? Have you been paddling a lot or not at all? Using your regular gear or need something new? Are you too busy to prep or do you have some free time? How do you like to eat/pack on trips in general? The same trip can lead to lots of different preparation strategies. In a couple days I'm headed to the Lost Coast - a stretch of northern California where the land is too rugged for the Pacific Coast Highway to actually follow the coast. It's a short but possibly intense trip - 75 miles of rugged, exposed coastline that none of us have done before. I'm excited for the trip but I've been busy at work, recovering from a sore shoulder and a couple rough whitewater trips and in general have other things on my mind. So my preparations have been rather minimal - a little virtual scouting on Google Earth, rustling up camping food from the kitchen cupboard, grabbing my standard gear. I'm sure I'll be fine, but hardly my normal thorough preparation. Luckily some of the other folks are doing the heavy lifting on this one - figuring out put in and take out locations, getting permits, beta from those who know and making sure the group has the requisite camping/eating/repair/safety equipment. And to a large extent they will enjoy the trip more because of this prep - which itself is fun to do for many of us. But I'm looking forward to getting out there and leaving everything else behind - the best part of a paddling trip is that once you've launched the preparation is over and you just do with what you've got. I'll be using my SPOT to post our nightly location. Anders has the full tracking feature on his SPOT so you can follow our progress real time HERE. For the second time in less than a week I ended up walking off a whitewater run. The first was the Rubicon epic detailed in my last post. This time it was not epic. In fact it was quite mundane and rather easy. After the trials of the Rubicon mission I had a weekend free for boating but no motivation to do anything strenuous. So I met up with a couple friends from Southern California at the N Yuba. 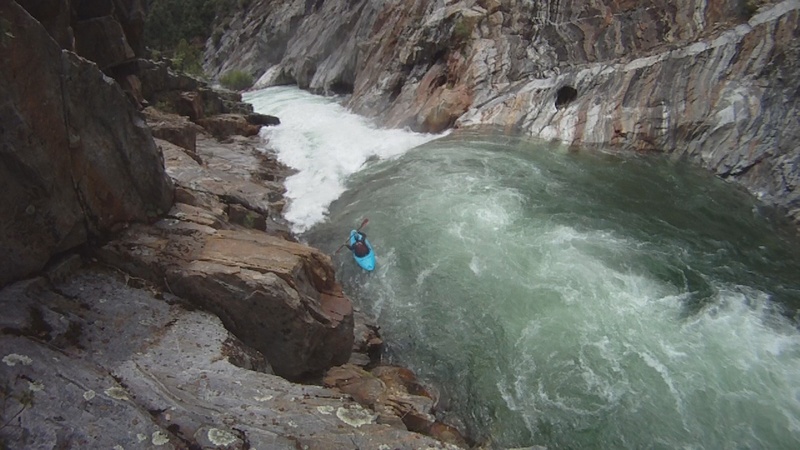 The plan was to do Pauley and Lavezzola creeks and some section of the N Yuba itself. All class IV runs that I've done before and knew should be relaxing and fun. The first day two of us did Lavezzola while the third member was still on the road. The flows were good and a little higher than the last time I did it. We took our time and had a nice little run. We had planned to do Pauley afterward - the runs are only 4 miles each - but we were feeling lazy and just went for a little hike instead. Our third arrived for burgers and beers in Downieville and we planned to hit the Sierra City run on the N Yuba the next day. We slept in since we wanted to wait for the flows to drop in a little from the diurnal high overnight. We drove up the river and left vehicles at the bottom and middle of the run so we had takeout options. We put on and the action on the run begins immediately. While Sierra City is not as hard as the Rubicon it actually has the same gradient - there are really no pools at all for the first five miles. After the first big rapid of punching a couple holes I pulled into an eddy and noticed my shoulder was sore. I had hurt it a month ago but thought it was all healed up. We pressed on and the more I paddled the more it hurt. So when we saw the road dip down close to the river I just climbed out and called it a day. Instead of hiking up 2,000 vertical ft. I only had to go up 50 ft. Then an easy two mile jaunt back to my truck. Not a bad hike out at all. The Rubicon always seemed like a legendary river to me. Just the name itself summons up a sense of mystery and adventure. Kind of like Big Foot - everyone's heard about it but descriptions are vague and no one has seen it in person. But even after hearing stories about this great river whose waters have been so dammed and diverted that it runs maybe once a decade, I still didn't really know where it was or what it was like. But the takeout is only about 50 miles from my house. And with our great snowpack in California it's finally got water in it - lots of water. The legend started becoming a reality. A little background on The Rubicon. It is a tributary of the Middle Fork of the American River. It lies between Tahoe and Sacramento. It spill out of Hell Hole Reservoir but does so rarely - the water is usually diverted for power generation. In fact, it's more famous for the jeep trail that crosses its dry river bed than the whitewater kayaking that the flowing river can offer. There is an upper and a lower run. The upper is 8 miles and a 'day' run, though there is little beta to be found on it. The famous run is the lower; it's 20 miles of continuous rapids normally done in two days. It's rated class V but some say it's an easy V and some say otherwise. 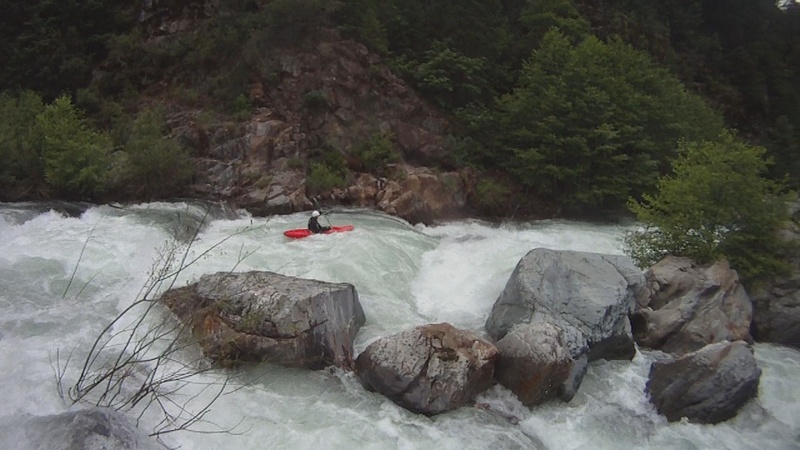 It's hard to get precise information but the general consensus is that it is one of the best rivers in California and you should never miss an opportunity to get on it. The trick is having water and knowing how much water is there. But thanks to Hilde's daily updates on boof.com we had flow reports. Word also came back that a group went in early with flows of 2000 cfs and found it too high and walked out after a couple scary miles. Without regular water to run through the river bed the willows have grown thick in the shallows and there are few eddies and even when you can find a place to stop you can't see anything.So the flows kept rising and I looked at my calendar and figured I would have time to research it and decide if I wanted to do it before the flows came into runnable levels. But then the flow dropped in half unexpectedly and it looked like there might be just one chance to do it - the flow was around 1,000 cfs which was the recommended optimal. I told work I wouldn't be coming in and emailed some folks to find out who wanted to tackle the myth. After the normal flurry of texts and random phone calls we ended up with a crew of seven but a late rallying time to accommodate busy schedules and long drives. We set shuttle with my truck at the bottom (we were only expecting five people at the time) and after rounding everyone up and getting to the put in it was 4 o'clock by the time we started paddling. But OH! what paddling it was. One rapid right after another, class IV/V, no eddies to stop in, no time for scouting, just charge it an go. We took our time as much as possible and relied upon a couple of brave probes to find the way. I took a swim early on after following the probes around a blind corner and into a terminal pocket hole. After a wild rodeo ride the swim was short and unremarkable and we continued on our way. But darkness was coming and we found a great sandy beach by a cliff wall to set up the perfect evening of camping along the river. We went to sleep well satisfied but a little leery of the long day we had ahead if we were to escape the gorge by the following evening as planned. Day two started fine with the water a little higher just due to the diurnal cycle. It was still rapid stacked upon rapid with some bigger ones thrown in for most of our group to portage. We moved at a deliberate rate - as fast as seemed prudent but not as fast as we needed. We had a couple more swims - nothing too serious but always a time killer. We had a couple of hard portages that involved climbing and ropes. Dinner time came and went as we pressed on. With no markers we didn't really know how far we had left - we only knew we hadn't crossed Pilot Creek which was about five miles from the takeout. The skies got darker, the rain started falling and several in our group were losing energy and out of fun tickets. After another swim and a check of the time we knew we were not going to escape that night so we sought out the best option for camping in the rain without any tents - we found a cave. The cave itself was a morale saver. The bonfire in the cave was a life saver. We weren't quite dry and warm but we were close enough to make it work. Everyone had brought some extra food and a communal dinner of beans and fig newtons and chicken Alfredo kept us nourished. We planned and early start and figured we could still make it out in time to salvage some of the following day. But the unexpected third day on the river was to be the worst. After a morning with little breakfast and no coffee we were paddling by 7:30. The river seemed big and pushy and a little more brown than blue - but we didn't think too much about it, we were focused on getting out. But the river was even more continuous now. Not as many big rapids but each one went on for hundreds of yards. Most of us were just as tired starting this day as we had been ending the last. I was flipping in places that shouldn't have bothered me and my roll was getting weaker each time. Eventually it failed in the middle of one of the endless rapids and I had a quarter mile swim that allowed me to appreciate how flush drownings really work. My team was there to help me but with sheer cliff walls and no eddies there wasn't much they could do. But as we passed one wall I saw a handhold and clung to it with all my might. I even found an under water step to get myself out of the water and time to breathe some solid air again. But to be reunited with my boat I had to climb the thirty foot cliff and traverse downstream a couple hundred yards. Only to get there in time to hear the decision on the rapid below - time to portage and break out the ropes. The fun part of the paddling was clearly over and we were into survival mode. We had another swim and several close calls. We had passed Pilot creek early on and knew the takeout was almost within sight. 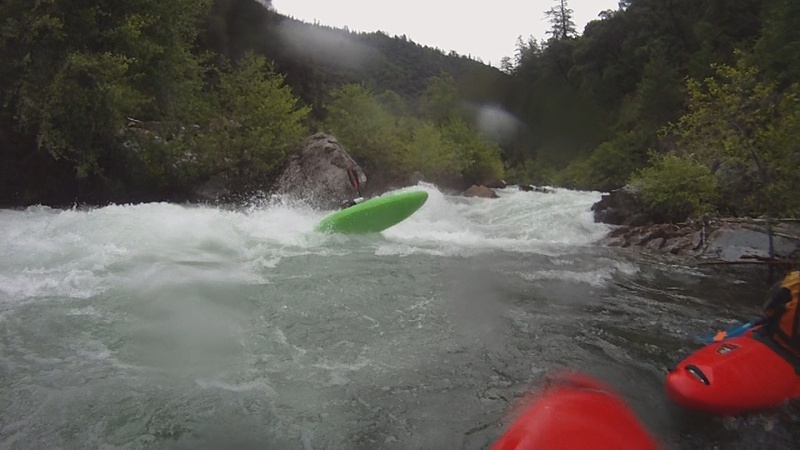 We saw Long Canyon coming in from the right and one of our members had done that trip earlier in the spring and had paddled the Rubicon out from there at much lower flows. But he did remember a big rapid right after Long and we stopped to scout at the first major horizon line. Sure enough, there was a big hole at the bottom. Big. Hole. River wide. While our probes had bombed into and through it the rest of us started climbing up and around. From our higher vantage point it was clear the river was now flooding - our conservative estimate was 3,000 cfs (we later learned it peaked at 5,500 that day). It was time to get off the ride. Conveniently we also found a jeep trail as we were were scouting. One that led from right where we were up and out of the canyon. So the decision was made to leave the boats for another day and hike out to the truck. We knew it was only a couple miles down the river but we also knew the road would be a much further and steeper route. We climbed up and up and after a couple hours of hiking hit the main road. While a couple of us took a well earned nap two brave volunteers started walking back down into the canyon towards the take out. This is where the story takes a turn back towards the happy. A kindly stranger picked them up after ten minutes and drove them to the takeout. There they found the two members of the party that kept paddling - not only alive a well but returned from town with cold beer and hot chicken. They all piled in and found us nappers along the road. Since we had some daylight left and a four wheel drive we drove down the jeep trail to retrieve our boats - turns out it's five miles and 2000 feet of elevation. We loaded seven boats and bodies, picked up the vehicles left at put in, made it to a mexican restaurant on the way home just before it closed, and I was in bed sleeping just after midnight. So the river that was a legend is now a river that will be legendary. We'll be telling stories about the night in the cave for years to come. About the time Alex told me ever so politely that I couldn't be in that eddy with her as we got spun around like rubber duckies in a toilet. Or when Taylor calmly cartwheeled his loaded creek boat to escape the unsightly death hole. How Wolf was always there with a rope for a swimmer or climber. Scott always calm with advice, encouragement or perfect lines to follow. Thomas giving the group pep talks and then charging it just like he told us to do it. And Matt always cheerful and positive even while scared and exhausted like the rest of us. 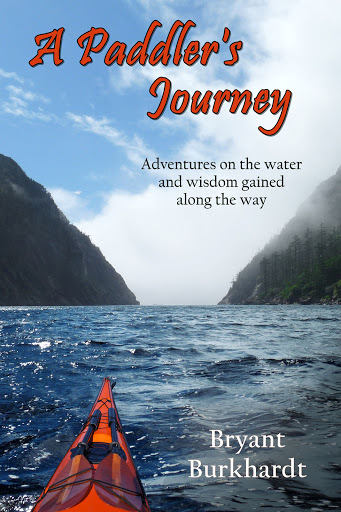 It's the ultimate brilliance of whitewater kayaking that brings out the best feelings in us while buried in some of the worst circumstances. It's an experience that sounds awful but will long be remembered by those that were there as the trip of a lifetime.That's what makes an epic.